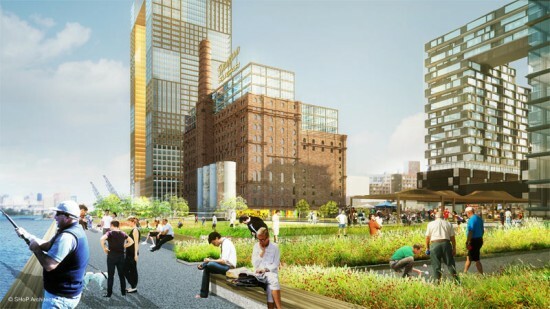 The $1.5 billion redevelopment of Brooklyn's Domino Sugar Factory has reached a potential breaking point just days before a vote to seal its fate. It’s New York Mayor Bill de Blasio against developer Jed Walentas in what can best be described as an old-fashioned standoff. The lines are drawn—here’s where things stand. The New York Times reports that Mayor de Blasio has insisted that Walentas increase the amount of affordable housing units at the site. 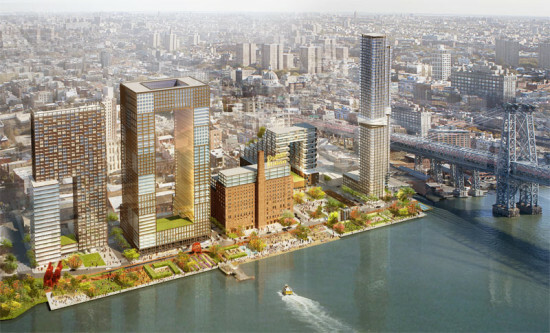 In return, his administration will grant approval for taller towers at the SHoP-designed site. Specifically, de Blasio’s team asked for an additional 50,000-square-feet of affordable housing, which would be used for larger units to accommodate families. But Walentas says he’s already done more than enough. The current proposal sets aside 660 of the total 2,300 apartments for low- and middle-income tenants. In fact, Walentas is reportedly so distraught over the mayor’s request that he has threatened to scrap the whole thing altogether. According to the Times, “Mr. Walentas is balking, and has even threatened to revert to the older, unpopular plan.” That plan only includes only 440 affordable units. While that seems unlikely, some affordable housing advocates are worried de Blasio’s gamble could backfire. Rob Solano, a local community board member and executive director of Churches United for Fair Housing, told the Times, “It’s a delicate balance between pushing as hard as you can and a break… If we get to the point where nothing is built, or there are more delays, that’s another day without affordable housing.” If that were to actually happen, it would be a major blow to the de Blasio administration, which has promised to “preserve or construct” 200,000 units of affordable housing over the next 10 years. Ultimately, this back-and-forth foreshadows the development battles to come as the mayor sets out to achieve his ambitious goal.